Batgirl made me more nervous than any other title in the New 52. While Gail Simone is one of my favorite writers and I trust in her, I shared the worries of many fans that restoring Barbara Gordon's mobility and having her take up the title of Batgirl again might be a step backward. While I didn't think we'd regress to the point of her carrying a red Bat-Purse or have her fix her make-up while Batman and Robin were getting beaten-up, I did agree there was a chance that much of the characterization Barbara had built up as Oracle might be lost. As I noted in my review of the first issue, this fears turned out to be completely fruitless. And while Birds of Prey fans didn't get any confirmation that Barbara's days as Oracle were still in continuity and we didn't get an explanation for how exactly Barbara was walking again, we did learn that she was paralyzed by The Joker's actions. We also learned that Barbara was still the same strong-willed survivor that we all knew and loved. More, Simone reminded us that Barbara Gordon has always been smart and strong-willed, whether she was working behind a computer screen or back-flipping across a rooftop. Every note that Simone needed to hit with the first issue, she hit perfectly. That quality of writing, coupled with the amazing artwork of Adrian Syaf and Vicente Cifuentes (which I cannot find the words to describe, so I've included extra scans with this review to showcase their excellent work) has made Batgirl into one of the best books DC Comics is publishing right now - the perfect balance between action, drama, comedy and romance. For action, we have the main plots regarding some new villains in Gotham. The first four issues center upon a new baddy called The Mirror, who dedicates himself to killing those who somehow cheated death under miraculous circumstances. To explain more beyond that would be to give away too much of the story but I will say there is a certain dramatic balance in pitting Barbara - an example of the power of hope to so many readers - against a villain whose entire motivation is to destroy the hopes of others. Issues 5 and 6 introduce another new baddie - a telepathic assassin known as Gretle, who seems to have it out for Bruce Wayne and - at one point - forces him to fight Batgirl! Both these villains allow Barbara a chance to showcase her fighting skills. But more than that, we get a chance to see how Barbara's greatest weapon in a fight is her mind, as she analyzes her enemies and figures out ways to maximize her own strengths against them. We also get to see that she's no mean detective, as she deduces what little she can from what few bits of evidence The Mirror leaves behind at his crime scenes. For Drama, we have the return of Barbara's estranged mother, who apparently walked out and left Jim Gordon to raise two kids on his own when Barbara was 12. Apparently Jim Gordon and Sarah Essen never became an item in this universe, as we are told Jim never found anyone else. For Comedy, we have numerous moments of the kind of wacky humor we Secret Six fans have grown used to. For Romance, we have little scenes like Barbara's date with her former physical therapist. We even have comedy mixed with romance as Barbara confronts Nightwing for the first time in a long-while and they quickly fall back into their old habits... until Barbara makes it clear, with a sharp edge, that whatever her feelings for Richard may be, she has to fight her current battles alone. With every little scene, we learned more and more about Babs' past in the new DC Universe as well as her current state of mind as she moves out of her father's home and into a new apartment. Her new roomie - an immigrant from Signapore named Alysia - is particularly noteworthy. Though she hasn't been given much page time, Simone has already established Alysia as someone who should not be messed with - a woman capable of patching-up Barbara's injuries but not without questions, immediately making it clear that if Barbara is a victim of some kind of domestic abuse that she is not going to tolerate it. It's subtle touches like this that make Simone's characters more real. Indeed, the one new creation who seems out of place is Detective McKeena - a Gotham cop who seems poised to become the General Ross to Batgirl's Hulk. 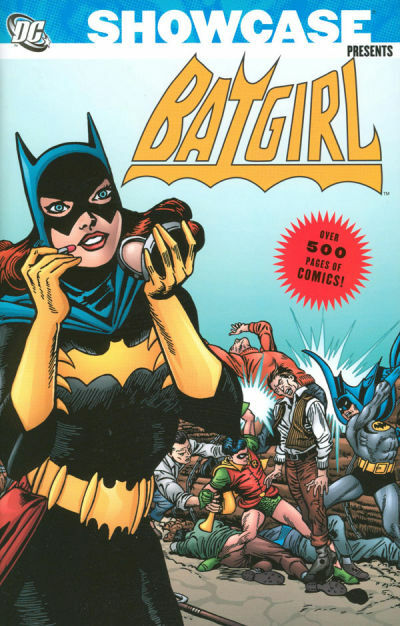 The first issue ended with McKenna's partner being killed after Barbara froze up while staring down the barrel of a gun for the first time since reassuming her activities as Batgirl. Blaming Batgirl for the whole incident, she has apparently spent her time on administrative leave obsessing over Batgirl and indeed she tries to arrest her in the middle of an incident where there is another, far more obvious threat endangering people and only Batman's intervention keeps Barbara out of a squad car. This kind of shallow stereotype is beneath Simone's usual level and we can only hope she gets fleshed out a little more in the future. Despite that, I have no qualms about declaring that Batgirl is a must-read book for any and all lovers of good comics everywhere.